Mostly Positive (57) - 73% of the 57 user reviews for this game are positive. “We want to involve the community strongly in the development process of Tiny Tanks. The game should improve through the feedback of the players in the early access period and adapt to the wishes of the community. 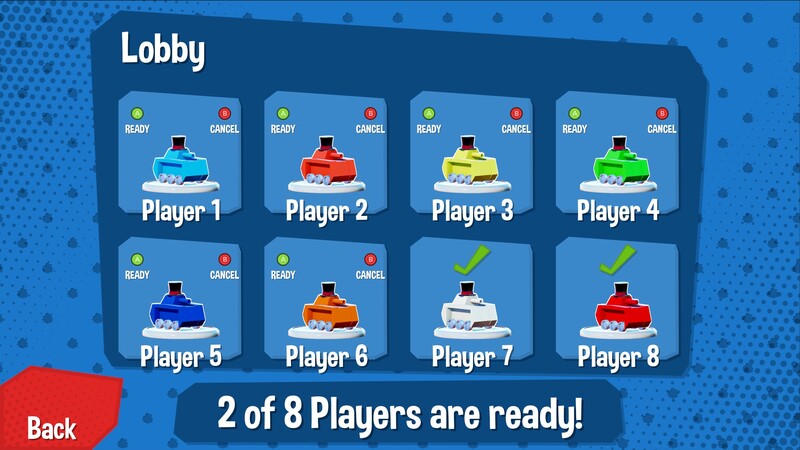 Above all, it is important to us to perfect the online multiplayer together with the community. “We have been working with our community since the beginning of development. That's why we set up a Discord Server some time ago, where we take the feedback and wishes of each individual to heart and participate actively in the discussions every day. We want to maintain this throughout the entire Early Access period and always work with our community! for the past days, we have been hard at work to get the first big issues fixed and your feedback implemented. First of all, we want to say sorry for all the issues that you encountered, but this is our first game and we are extremely grateful for every piece of feedback! Thank you so much for that. Reworked the Lobby. Now there should be way fewer issues with setting up a game and the rework should get rid of the endless loading screen issues. Additionally, the loading times should have improved. This means that a few functions are disabled right now, including playing custom maps and selecting game modes, but these will be added back in very soon! This rework also enables us to later implement proper matchmaking which can be expected to be added soon. Thank you to everyone who has bought the game and given us feedback. We really rely on your help to make this game better and are extremely thankful that you are helping us so much. The next update is already in the works and we hope to get it to you soon! as you might know, we are rapidly nearing the release on April 11, 2019. We are only 3 weeks away now and we are as excited as you are. So let us talk about all the stuff we have been doing right away! Almost two months ago we started to develop a weapon system for Tiny Tanks based on your feedback. We now have several weapons spawned by an Airdrop during each round. For a long time, we had the problem that the gun was much too weak compared to the mine, with the new system everything has changed. Furthermore, the tactical approach has improved a lot throughout the game, as you have to adapt a little to your weapon. For example, you have to get very close to your opponent with a shotgun and position yourself strategically with a sniper. In the last weeks, Lukas has invested a lot of time in our menu and the UI of the game. We had to create windows for the workshop integration, the level editor and the online/offline lobby. Last but not least we decided to implement a Health Bar and an Ammo Display (for the new weapon system) to get a better overview in the game. We have been able to improve the collision between tanks and bullets, which has greatly improved the feeling of the online multiplayer. Furthermore, we could reduce network traffic through a system that measures how blocks travel. We're currently in the final stages of testing the online multiplayer and we're confident that it will perform well when released. In the last two months, we could improve several points regarding gameplay. We've added a variety of particle effects to give better feel to the shooting, as well as a hitstop to increase the impact of the shot. We also added a variety of sounds in collaboration with the audio team Syndrone. We are working very closely with them to create an awesome atmosphere for Tiny Tanks. They are super passionate and skilled and we love working with them. If you want to know what they have done so far check out their website. As mentioned in the last newsletter, we have developed a level editor for Tiny Tanks, so you can build your own awesome maps. In the last weeks, we were able to add many exciting new features to the editor. The most important feature is the Steam Workshop Integration. You can now share your maps with everyone via the Steam Workshop and download plenty of maps instantly. That's it for this update. Thanks for reading and for supporting us. Please don't forget to visit our Discord for all the freshest news. We are excited to see what April brings. See you around! ADD OUR GAME ON YOUR WISHLIST AND/OR FOLLOW US! To keep things interesting there are regular air-drops with gun crates. Each containing a different weapon. Pick 'em up and get going. Who is going to stop you when you are shooting with homing missiles. With our integrated level editor, you can build your own maps. Thanks to the Steam Workshop integration you can share your creations with the whole world and play your maps in the online multiplayer! Get new ranks, unlock new maps, modes, modifiers, and tank parts as you go.